The latest innovation from Swashdrive, a sleek, lightweight, slim line cartridge tattoo machine that really does make it seem like you are tattooing with a Brush. Every machine comes with two pushrods (1 solid/ 1 adjustable). The new brushless motor powering our latest machine is a whole new technology in small DC powered motors. Startup voltage is 9.0 volts, this is the minimum voltage needed to power up the electronic circuit board that controls the motor. 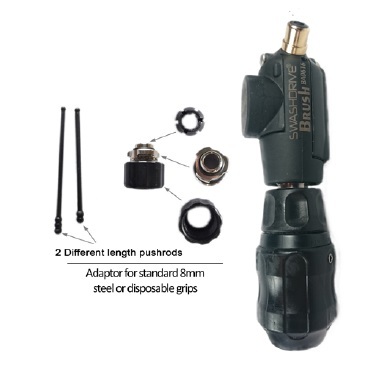 The grip is a k-mount version of our easily adjustable and autoclavable Swashdrive Grip and comes with 1 hard and 1 soft grip cover. The brushless motor powering your new Brush is an entirely new technology in small DC powered motors. A minimum start-up voltage of 9.0 volts is required to activate the electronic circuit board that controls the motor. This may seem high but that’s the way it’s designed and will not cause any damage. The current draw at 9.0 volts is only 0.1 amp (0.9 watt) and 20 volts will draw 0.5 amps and deliver a massive 10 watts of power. Motor spool up may seem slow at first but this is part of its electronic programming to ensure a softer ramping up of motor acceleration up to the desired RPM. This is very different to a typical brushed motor which responds instantly when it’s powered up. The brushless motor also has an internal speed governing circuit which maintains very accurate speed settings as load varies during operation. The result is super smooth running and zero motor surging. The positive (Red) wire must be connected to centre of the RCA plug. Wiring the machine the other way will not destroy anything, it simple will not operate ! There is also an overload cut out to prevent motor destruction in the event of a lockup or overload situation. In this case the motor will trip out and reset after 3 seconds before restarting.